What is a key industrial tool for improving worker safety and increasing productivity? The answer might be right under your feet. The humble industrial mat is used in a variety of facilities, from factory floors to hospitals. 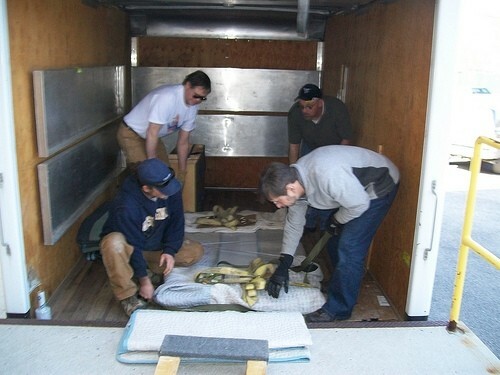 Some mats make surfaces safer by increasing traction and absorbing spilled liquids or melted snow and ice. Others can make floors more comfortable to stand on — an important ergonomic tool for workers who are on their feet for extended periods of time. There are many types of mats for a variety of applications: One mat does not fit all. Which type of mat could benefit your facility? That depends on what you need the mat to do. For to reduce risks in high-traffic areas where spillage of water, solvents, coolants, or oil is likely to occur, place absorbent floor mats in spill-prone locations. Absorbent mats such as Rag Rug Industrial Absorbent Floor Mats can provide extra traction and make your spill areas safer. These economical rugs have high tensile strength and are made of recycled materials. The dark color successfully hides unsightly grime. Employees who spend their days on their feet — such as workers in kitchens, hospitals, or industrial floors — may experience discomfort or even pain during long periods of standing. Anti-fatigue mats promote employee wellness and increase comfort. The mats are National Floor Safety Institute approved and are proven to have 40% higher non-slip quality compared to any other sponge mat. Employees who use anti-fatigue mats also enjoy decreased spinal compression, increased circulation, and reduced exposure to prolonged heat, cold, or vibration. Slip, trip, and fall risks are high in the workplace; especially in areas where floors tend to get slick or in inclement weather when workers track in moisture from outside. Oil-drip floor mats can increase floor traction to prevent workplace injury, but also serve a variety of other purposes. The Abzorb Oil Mat is commonly used as an oil-drip mat under vehicles or facility machinery. Homeowners often use this mat in their garages to prevent concrete stains or even as a pet mat to go under Fido’s food and water bowls. Industrial mats are an easy, economical solution for improving your facility’s overall safety and enhancing your workers’ health and well-being. So if you don’t already have any of these three mats in your facility, it’s time to see how something so simple can make such a big difference. 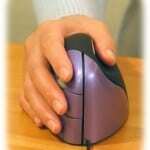 Ergonomics is the process of fitting a work environment to a person. Workplaces with poor ergonomics tend to experience higher rates of musculoskeletal disorders (MSDs), placing a heavy financial burden on the company in the form of both direct and indirect costs. MSDs — conditions and/or injuries which affect the muscles, tendons and nerves — are easily prevented through proper workplace ergonomics. By adjusting the workplace to create a proper environment for workers, there are naturally fewer instances of MSD injuries. To put the problem of MSDs into perspective, the U.S. Bureau of Labor Statistics (BLS) released a report stating that a third of all reported work injuries and illness in 2011 (387,820) were related to MSD. The report also noted that industries with the highest rates of MSD were hospitality, retail, transportation, retail, warehousing and construction. Notice something in the common with these industries? They all require moderate amounts of heavy lifting. Lifting heavy boxes, tools or equipment improperly is poor ergonomics and can lead a wide variety of MSD injuries, including back strains and vertebrae problems. The correct way to lift an object is to plant your feet about shoulder width apart, bend your knees to lower your body, grab the object and lift it back up. Do not attempt to lift an object by bending your back, as this places unnecessary stress on the delicate cartilage supporting the vertebrae. One of the first steps in reducing MSD injuries through workplace ergonomics is to identify ‘problem areas.’ This may include areas stations where workers are forced to bend or maneuver their bodies in awkward positions. This may not cause any immediate injury to a worker, but constantly shifting the body into awkward positions day after day will eventually take its toll, leaving the individual susceptible to MSD injury. Go through your workplace to see exactly which areas the most problematic for workers and then prioritize them accord to severity. You can also improve the ergonomics of your workplace by investing in anti-fatigue mats. 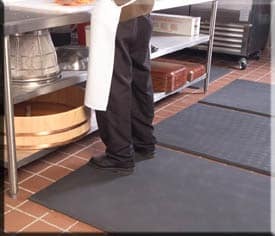 These mats are designed to absorb the weight and pressure of workers; thus, offering a more comfortable area to stand on. Rather than forcing workers to stand on hard concrete pavement for 8 or more hours a day, they can stand on an anti-fatigue mat for a superior level of comfort. 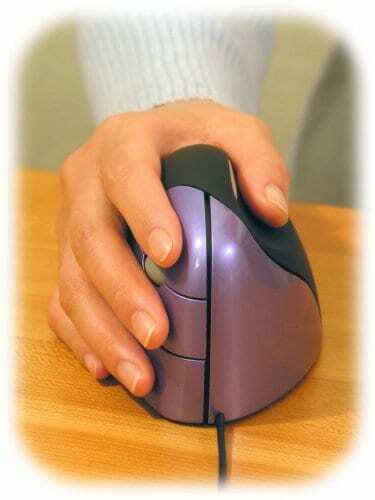 [sc:date] Ergonomics is a topic that’s oftentimes overlooked or misunderstood among employers. Whether your workplace is a typical office setting or an industrial factory, you should carefully analyze ergonomics to ensure workers are given a safe, healthy environment to perform their professional duties. The term “ergonomics” literally translates from the Greek language into “work” and “laws,” which sums it up pretty well. For a closer look at the impact of ergonomics in the workplace, and steps you can take to improve it, keep reading. So, what exactly is ergonomics? In short, it’s the science/relationship between a worker and his or her environment. The concept of ergonomics focuses on creating an ‘ideal’ work environment where physical stress is reduced. Physical stress in the workplace is typically caused by one of two different elements: environmental factors and employee motion. An example of an environmental factor is a poorly designed office chair which lacks lumbar support. An example of physical stress caused by employee motion is a worker bending their back (rather than their feet) to pick up a box or heavy object. Allowing employees to work in an environment with poor ergonomics leaves them vulnerable to injury while reducing their overall efficiency and productivity. The truth is that most employers overlook the importance of ergonomics in the workplace. When employees are constantly stressed on a daily basis, their normal physical body functions gradually begin to decline. The same job they used to complete in an hour might take them an hour and a half now. And rather than showing up for their shift every day, they might call in sick once a month. It’s the subtle nuances such as this that really cut into companies’ revenue and ultimately their profits. Rather than completely renovating your workplace with new flooring, you can lay out anti-fatigue mats in high-traffic areas to improve its ergonomics. These mats are designed to create a softer, more comfortable area where employees can safely work.